Complete your Gen II weighing system with the Entry / Exit Package! Narrow Entrance so animals sort out who is first to enter the scale before they are at the entrance gates of the scale. Upper “I” shaped crowding bar prevents animals from doubling-up as they enter the scale. 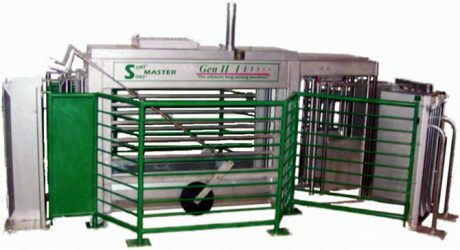 Side Panels keeps Gen II completely isolated from animals within the pen. Side panels with drop pins are easily removed for quick access to the scale, or the Gen II can be moved quickly and easily to an alternate room in the facility. One-way Exit Gates prevent animals from reversing or interfering with animals exiting the scale. 1 x stainless entrance kit with upper crowding bar and brackets. 2 x powder coated side panels with pins and stainless side blockers. 2 x one-way exit gates with side panel adaptor brackets.